Ok folks. The time has come for NextGen Player's much anticipated Gears of War Contest. So what are the deets you say? Very simple. 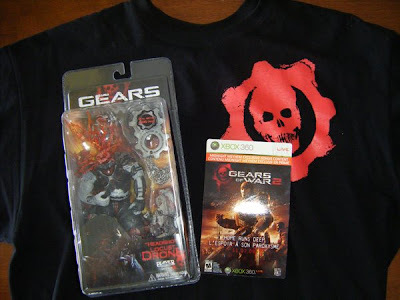 All you have to do is send an email to contest@nextgenplayer.com between now and January 4th with the subject line "NGP Gears of War Contest". And to give you an additional chance to win, we will give you one extra entry into the contest if you sign up for our FeedBurner email updates between now and January 4th. Our FeedBurner sign up is located on the right column of our website (near the top). The contest officially ends on January 4, 2009 at 11:59 pm ET. NextGen Player will randomly select a grand prize winner from all of the eligible entries. The Grand Prize winner will be notified by email on January 5, 2009 with details on how they will receive their prize. This contest is open to all legal residents of Canada and the United States. You must be 18 years or older to enter the contest. Only one entry per email address will be accepted (the exception is the additional entry you will receive by signing up to our FeedBurner email updates). For more details on our general contest rules, click here. I so wish I could win this as I wasn't able to get the Locust Drone Headshot Figure. I'm all over this like a fat kid on a smartie. Entered. Thanks for the contest!